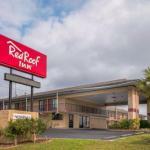 The free Wi-Fi and parking flat-panel TVs and handy I-65 location minutes from downtown are among the welcome list of features at the Red Roof Inn Mobile - Midtown. The two-story Red Roof Inn Mobile - Midtown houses 73 exterior-accessible rooms featuring flat-panel TVs coffeemakers and desks while some also provide microwaves and mini-fridges. Complimentary Wi-Fi is included at the hotel. On-site parking is free. The hotel also allows pets and offers front desk service 24/7. Off I-65 this Red Roof Inn is six miles west of downtown Mobile home to the Gulf Coast Exploreum Science Center & IMAX Dome Theater. Drive seven miles east to explore the historic battleship the USS Alabama. Municipal Park less than four miles west hosts the Mobile Museum of Art. Guests are also within a mile of shopping and dining options at Bel Air Mall. Grab the little ones for some family-style fun at the Mobile Zoo a 40-minute drive west. Flights at Mobile Regional Airport can be reached nine miles west of the hotel.